Saunas have long been used for relaxation, weight loss and stress relief. 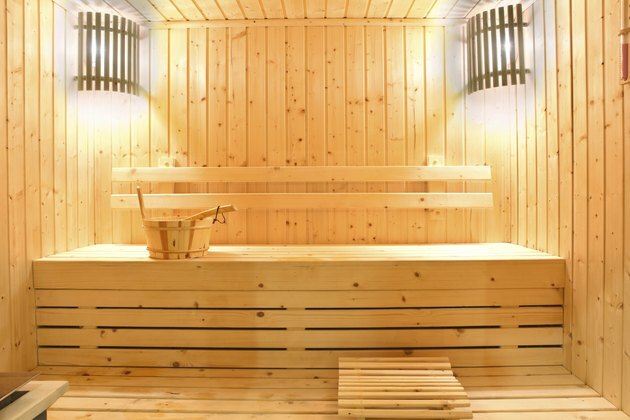 Saunas have been shown to lower blood pressure, at least temporarily. Most medical experts say that sauna use is not injurious to people with normal blood pressure. However, research has shown that the effects of a sauna’s high temperatures can be harmful to those with high blood pressure and heart problems. High blood pressure, also known as hypertension, is diagnosed when your systolic blood pressure is routinely above 140 or your diastolic pressure is above 90. If not treated properly with diet, exercise and medication, hypertension can lead to serious complications such as damage to your arteries, heart, kidneys and eyes. Because high heat can have unpredictable effects on blood pressure, people with hypertension should consult a medical expert before using a sauna. Saunas use wet or dry heat to raise the temperature of the sauna user’s skin to above 103 degrees Fahrenheit, according to Harvard Men’s Health Watch. This alteration in skin temperature promotes sweating, the elimination of toxins through the skin, a faster heart rate and lower blood pressure. Many people report feeling relaxed and cleansed by a session in the sauna. For healthy adults the reduction of blood pressure is a temporary reaction to the body’s rise in skin temperature. When a healthy person exits the sauna, blood pressure returns to normal. People with high blood pressure also experience this temporary lowering of blood pressure, but after leaving the sauna their blood pressure can behave abnormally, sometimes rising dramatically. Sauna use should be confined to 20 minutes or less, according to Harvard Men’s Health Watch. Drinking several glasses of water after a sauna is important, since the average sauna user loses a pint of sweat during a sauna session. Saunas should never be used alone, while or after drinking alcohol or using drugs or when ill. Though people with controlled high blood pressure might be able to use a sauna without any negative effects, people with unstable hypertension should consult their doctor before experiencing such intense and sudden temperature change. People with uncontrolled or unstable hypertension who use a sauna without medical approval may be at risk for serious complications, according to the Canadian Medical Association Journal. Because of the unpredictable reaction of blood pressure to sudden temperature change, taking a sauna may elevate blood pressure during or after a session. Prolonged high blood pressure can cause vision problems, memory loss, kidney damage, heart failure, heart attack or stroke, and aneurysm, according to the American Heart Association. Canadian Medical Association Journal: The sauna – a health hazard?